Aims and Objectives: The present study aims to evaluate the gender dimorphism of the angle SN-FH between the sella-nasion (SN) plane and the Frankfort horizontal (FH) plane among the three types of skeletal malocclusion in South Indian population. The objectives included measurement of angle SN-FH, FH to the nasion (NFH), FH to the sella (SFH), and the difference of NFH and SFH (Δ). The null hypothesis was that there exists no variation of the angle SN-FH, NFH, SFH, and Δ between males and females and in the different skeletal relationship of jaws. Materials and Methods: Cephalometric data were retrieved from the archived records of 180 patients, comprising 90 males and 90 females, within three subgroups. Class I (60), Class II (20), and Class III (10) in each of the gender class were examined. Student's “t” test was used to analyze means of the gender differences and analysis of variance between subgroups, and significance was set at P < 0.05. Results: The average values obtained from this study for the overall population are 8.06 ± 3.34; for males, it is 7.42 ± 3.62, and for females, it is 8.7 ± 3.48. The gender difference is statistically significant only in Class I malocclusion (0.002). There is no statistical difference between different skeletal classes of malocclusion. Conclusion: The null hypothesis is partially rejected for as significant difference is established only for some of the parameters under the study. As orthodontists, one needs to be appreciative of the transformations that occur in the face from its embryonic form through childhood, adolescence, and finally maturing into the adult form. These changes many times are measured by cephalometric interpretations. A foremost consideration for during cephalometric analysis is the establishment of a reference plane or a coordinate system for quantification of the growth activity of the facial elements. These references signify the stable anatomical structures in the cranium where can be measured and compared and are also are valuable in diagnosis, treatment planning, and assessment of the treatment progress. The orthodontic literature is full of orientation and reference planes, but a valid cephalometric plane of reference should be reliable as well as reproducible with low interexaminer variability and should be as close as possible to that of true horizontal (HOR) through the cranium, with the head in its normal position. The best-known intracephalic reference lines that are widely used despite their variability is Frankfort horizontal (FH) plane and the anterior cranial base represented by sella to nasion (SN) plane. FH plane (also called the auriculo-orbital plane) was first introduced by Von Ihering in 1872 but slightly modified and correctly established at the World Congress of Anthropology, in Frankfort, Germany in 1882., The FH plane is now defined as the plane would pass through the upper borders of each ear canal or external auditory meatus (Porion/Po) and through the inferior border of the orbital rim (Orbitale/Or). Before the anthropology met, this plane was defined so as to pass through the center of the external auditory meatus to the lowest point of the inferior margin of each orbit. It had the advantages that its reference points were well demarcated, easily accessible, and on an average, it corresponds reasonably well with the HOR plane through the cranium. SN line is also a reliable cranial base reference, dependable, and stable and is also structurally meaningful as it represents the anterior cranial base. Accordingly, the relationship between SN plane and FH plane represented by the angle SN-FH is essential in analyzing the cephalograms as one describes the anterior cranial base whereas the other plane FH plane closely represents the HOR plane. Bjork by his cephalometric studies established that the variations in the growth and slope of the cranial base may lead to differential movement of the position of the jaws and have an effect on the cephalometric values while SN plane alone or in conjunction used as a reference plane. Making an allowance for this, Moore published corrected norms for individuals with low or high inclinations in their anterior cranial base which has been referred to as a correction factor. Since the FH plane represents the closest to HOR plane, the angulation of the SN plane to FH is measured first and the required correction is made. The angle between the two reference planes FH and SN is on average 7° and changes relatively little during growth. If the given SN-FH value more or less than 7°, a corresponding alteration is made to SNA, SNB, and SND values to offset the discrepancies due to the inclination of the anterior cranial base. A review of the literature suggested that there is a scarcity of data regarding the sexual dimorphism of the angle SN-FH. Further, in the previous studies, the subjects were not assessed based according to different classes of skeletal malocclusion, and different values were reported. Most of the studies evaluated the angle SN-FH either with relevance to a particular type of class of malocclusion or aimed at gender stratification. Alves et al. evaluated the pre- and post-treatment values of the angle SN-FH angle in orthodontic patients undergoing orthognathic surgery. Few studies included a particular class of malocclusion without reference to sexual dimorphism such as a study by Bacon et al. 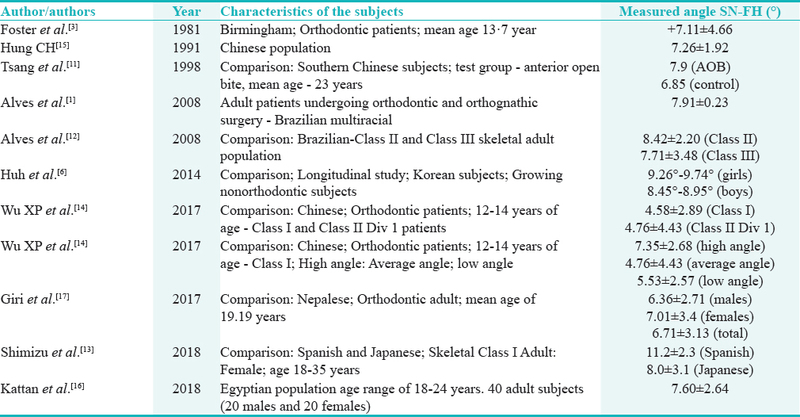 on subjects with dental and skeletal Class II malocclusion; Tsang et al. indicated a steeper inclination of the anterior cranial base of on subjects with anterior open bite. The study of Alves et al. compared the inclination between the two cranial references lines in Class III and Class II group skeletal patterns while Shimizu et al. conducted a study on Class I subjects and Wu et al. appraised of the angle SN-FH in different vertical growth patterns of Class II Division 1 patients. Other studies such as Huh et al., Hung, and Kattan et al. appraised the angle by gender stratification without any particular reference to vertical or sagittal malocclusion characteristic of malocclusion while the study by Shimizu et al. compared the Spanish and Japanese female subjects for the angle SN-FH in Class I Subjects. Further, all the studies are on non-Indian population such as Brazilian study by Alves et al.,, Tsang et al., and Wu et al. on Chinese Subjects, Huh et al. 's research on Korean population, Spanish and Japanese subjects by Shimizu et al., Kattan et al. evaluation of Egyptian patients and a study on Nepalese population by Giri et al. The present study is aimed to evaluate the sexual dimorphism of the angle SN-FH between SN plane and FH plane among the three types of skeletal malocclusion in South Indian population. The objectives included the measurement of the angle SN-FH, closest distance from the FH to the nasion (NFH), FH to the sella (SFH), and the difference between the NFH and SFH (Δ) [Figure 1]. The null hypothesis was put forward that there exists no difference of the angle SN-FH, SFH, NFH, and Δ between males and females in different classes of malocclusion. After obtaining the clearance from the Institutional Regulatory Board (Ref:148408060/2015), the database for cephalometric evaluation was obtained from the preexisting records of the patients who had registered for orthodontic treatment between 2012 and 2016 at Narayana Dental College, Nellore, Andhra Pradesh, India. All the radiographs were being taken with the cephalostat (VILLA SISTEMI MEDICALI, MODEL NO: MR05, TYPE 84086511, 2003, Italy). The inclusion criteria included healthy subjects of 18–25 years of age without any history of systemic diseases/developmental anomalies/trauma/drug therapy interfering with growth. A full complement of permanent teeth excludes the third molars with normal growth pattern without any transverse, vertical discrepancies and remarkable facial asymmetry. The exclusion criteria were the significant medical history that would affect physical development and growth. Records of the patient with developmental or acquired craniofacial or neuromuscular deformities/temporomandibular joint dysfunction are discarded. None of them had undergone previous orthodontic/orthognathic or prosthodontic treatment, and those with missing teeth were excluded. For analysis purposes, the data were categorized as Class I, Class II, and Class III skeletal patterns depending upon the Wits appraisal. A minimum sample size of 16 in each group was required to detect a difference of 2° angular or 2 mm linear measurements between the groups keeping the power of the study at 0.8 and alpha value of 0.05. The final sample included 120 subjects with Class I, 40 subjects with Class II, and 20 with Class III malocclusion with equal distribution between males and females. This is done to ensure that the distribution of sample size is close to the normal prevalence of Class I (66%), Class II (22%), and Class III (11%) for the population under study [Figure 1]. The demographic details were masked on the cephalogram before tracing. All the radiographs were traced manually by the procedure described by Huh et al. in a standardized manner by a single observer (SRR) to avoid errors due to interexaminer variability. The following landmarks were identified [Figure 2]: (1) nasion (N), (2) sella (S) (3) porion (Po), (4) orbitale (Or). The reference planes were constructed: (1) SN plane by joining S and the N point and (2) FH plane by joining the Po and the Or. The angular measurements included the angle between FH and SN (SN-FH) and the linear measurements comprised of (1) the closest distance from the FH to the nasion (NFH), (2) the closest distance from the FH to the sella (SFH), and (3) the difference between the NFH and SFH (Δ). To test the consistency of the measurements, initially, 20 cephalometric radiographs were randomly selected and measured after 1 month again following the initial readings. The coefficient correlation for concordance is found to be 0.75 for the angular and 0.8 for linear measurements. The intraclass correlation coefficient (ICC) test for the identification of the landmarks and reference plane used in the study is found to be 0.982 for SN-FH, 0.981 for SFH, and 0.993 for NFH. The readings of the male and female group were documented separately in each of the subgroups. The mean and standard deviations were calculated for each of the measured parameters. The Statistical Package for the Social Sciences (SPSS) V 21.0 (IBM, New York, USA, 2012) was utilized for statistical analysis. The data were summarized as mean ± standard deviation in excel spreadsheet (MS windows, 2010). The demographic and descriptive parameters are tabulated in [Table 1]. The normal distribution of quantitative variables was verified using Shapiro–Wilk test. Two-tailed independent t-test was applied to determine significant differences between genders in each of the three classes of malocclusion. The analysis of variance (ANOVA) test was used to find whether any difference exists between the means of parameters tested in between the three classes of malocclusion. Pearson's correlation test was done to determine if any correlation exists between the measured parameters. Multivariate test was done to compare the dependent variables SN-FH, SFH, NFH, and Δ with the independent variables gender and malocclusion. Differences with P < 0.05 were considered statistically significant. The descriptive data are shown in [Table 1], and the mean age is uniform in all the groups under study [Table 1]. The data are found to be a normal distribution. On the evaluation of the data, it is established that in the given sample, the mean values for the SN-FH is comparatively higher in females in all the skeletal classes [Table 2] and [Table 3]. However, this difference is found to be statistically significant (0.002) only in skeletal Class I malocclusion with males (7.08 ± 3.59) and females (9.06 ± 3.09). In contrast, the linear parameters SFH and NFH exhibited greater dimensions in males compared to females. This variation is found to be statistically significant in Class I (P < 0.001) and Class II (P = 0.002) malocclusion as related to SFH. In none of the classes of malocclusion, the NFH parameter is statistically significant. The variation in the SFH is more marked in comparison to NFH distance. The measurement of difference (Δ) between the SFH and NFH in Class I is 8.80 ± 5.09 in males and 11.58 ± 4.45 in females (P = 0.002) and is statistically significant. 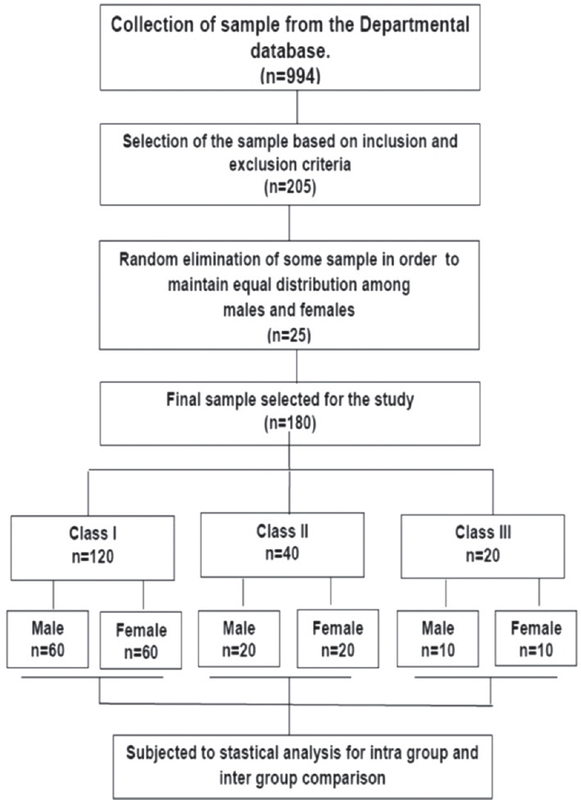 The difference in the means of each of the parameters among the three classes of malocclusion analyzed by ANOVA was found to be not statistically significant in the overall sample as well as within males and females [Table 3]. The correlation coefficient analyzed by Pearson's correlation test between SN-FH and SFH is found to be negative in both males (−0.426) and females (−0.492) as the SN-FH increases the SFH value decreases and vice versa. 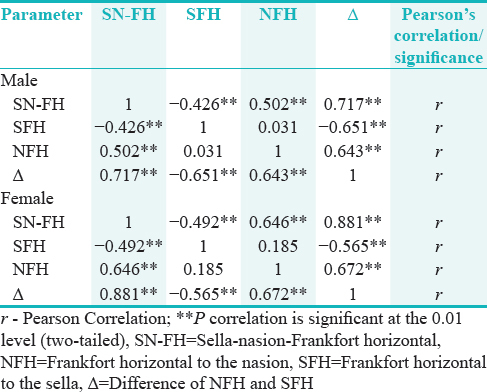 There is a strong positive correlation between SN-FH and NFH; SN-FH and Δ values in both male (0.502; 0.717) and female (0.646; 0.881), respectively, indicating a significant association [Table 4]. The results of the multivariate tests: In this case for the first independent variable gender, the Pillai's trace value is 0.109 with an F value of 2423.97. This is significant at 5% level as the P =0.001 and indicates that the gender values were not at the same level for all the dependent variables. For the type of malocclusion and combined effect of gender and malocclusion, the Pillai's trace is not significant, and hence, there is no difference for all the dependent variables [Table 5]. The main function of cephalometric reference lines is to describe and classify the craniofacial complex and the dentition. The most commonly used reference planes are FH plane and SN plane which represent the anterior cranial base. The implications of the previous studies,, have shown that the length and inclination of the cranial base to a large extent and the length to some extent are controlling factors of anteroposterior jaw position. Consequently, the measurements using SN as a reference line indicated abnormal jaw positions despite normal orientation of jaw bases. Further, it was observed that accurate information was obtained when the same dimensions were being calibrated with the FH line because the FH plane can be effectively used as a reference plane while measurements related to both the anterior and posterior cranial bases are being calibrated. If the anterior cranial base is abnormal in angulation, one should either use corrected “norms” or use measurements which use the FH line as a reference. The subjects of most of those investigations were non-Indian descents,,,,,,, [Table 6]. Hence, the present observational study was taken up to explore the gender differences of specific parameters that relate the angulation of the anterior cranial base to FH plane in different classes of sagittal malocclusion, and the sample is being drawn from South Indian population. The parameters SN-FH, SFH, NFH, and difference (Δ) between SFH and NFH were measured. SFH represents the position of S point concerning the FH plane at a posterior point, NFH represents the position of N point concerning FH plane at an anterior end, and Δ (difference of SFH and NFH) represents the actual shift of the anterior cranial base in upward and forward direction. The total sample is divided into Class I, Class II, and Class III for this purpose of evaluation based on the inclusion criteria with equal distribution of male and female samples. Initially, sexual dimorphism was evaluated in each class of malocclusion separately and then in the sample as a whole. Evaluating the gender variations, there is a general tendency of females exhibiting higher values for the angle SN-FH and Δ values in all the skeletal classes of malocclusion. The difference is statistically significant in Class I malocclusions only, and gender dimorphism of FH-SN angle could not be established statistically in Class II and Class III malocclusions [Table 2] and [Table 3]. On the contrary, the linear dimensions SFH and NFH are relatively greater in the males. The measurement of difference (Δ) between the SFH and NFH in Class I is 8.80 ± 5.09 in males and 11.58 ± 4.45 in females (P = 0.002), indicating that the difference is statistically significant. However, the NFH was not statistically significant implying that there is not much difference in the change of the position of nasion in both the males and females. The difference (Δ) of SFH and NFH is noticeably higher in females suggesting a steep plane of inclination of the anterior cranial base in females. The difference in the mean values of SN-FH, NFH, and the Δ in Class II malocclusion between both the genders was also found but is not statistically significant. The only parameter that exhibited statistical significance in Class II is the SFH measurement implies that in Class I or Class II, the position of sella from the FH plane varies in males and females. The results clearly show that the sexual dimorphism of the SN-FH angle in all the adults is due to the change in the SFH value (position of sella about FH plane) as the difference in the change of NFH is not appreciable. This is an important observation which needs further investigation. In Class III (n = 20 male =10 female =10) malocclusion, none of the parameters had shown any statistically significant. Further, the anterior cranial base inclination is found to be least in the Class III group in both males (9.60 ± 2.67) and females (9.90 ± 5.25) [Table 2] and [Table 3]. The results in this study were in concordance with the study by Huh et al. on Korean and Giri et al. 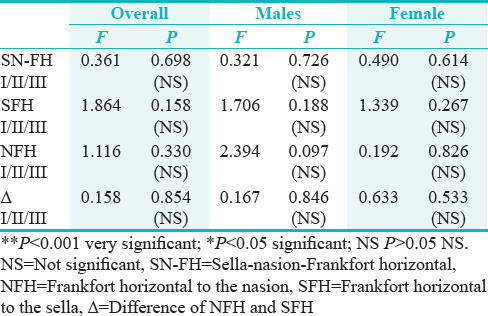 on Nepalese Population who also reported from their research a higher value of SN-FH for female subjects as compared to males [Table 3]. Huh et al. in a longitudinal study found that in the growing child, the absolute dimensions of the mean values of SN-FH were larger in boys than in girls, and the difference of NFH and SFH (Δ) was larger in girls than in boys. In their study, they showed that the SFH and the difference Δ revealed some variations between genders, whereas the NFH exhibited a relative similarity in both the genders. The results obtained in the present study also suggested a similar relationship with the difference being adult subjects in the current study. Another interesting finding is that the average SN-FH values in the present population group are higher than any of the values obtained from the previous studies conducted on non-Indian subjects,,,,,,,, except for the Spanish adult women subjects (11.2 ± 2.3). Another objective of this study was to evaluate the FH-SN angle in different skeletal relationships, namely Class I, II, and III. This finding is in concordance with Alves et al., who also found that FH-SN angle was greater in skeletal Class II relationship compared to skeletal Class III. However, the results of ANOVA reveal that the differences between the different malocclusions are not statistically significant for any given parameter between different classes of malocclusion. Moreover, none of the interpair combinations exhibited >2° of difference for the SN-FH angle in the present study [Table 1]. The Pearson's correlation test is found to be statistically significant in both the genders for the individual pair of parameters, except SFH-NFH correlation which is least among all the correlation values. Likewise, there is a negative strong correlation between SN-FH and SFH as well as with the steepness of the cranial base which is determined by the measurement Δ [Table 4]. It is incurred that the vertical changes at the nasion may be compensated by the sagittal shift of the sella due to posterior growth of the cranial base and the change in the Δ as well as the concurrent SN-FH angle. In the multivariate test, only the gender had shown significant result indicating that there exists a difference of all the dependent variables compared to independent variable gender (between males and females) and no significance of all the dependent variables when compared to the independent variable type of malocclusion [Table 5]. From the above discussion, it is hard to justify the standardization of SN-FH as 7° for both males and females of South Indian population. The results of the present study support this conclusion in many respects. First, there is a wide range of mean SN-FH from 7.08 ± 3.59 in Class I males to 9.06 ± 3.09 in Class II females. The mean SN-FH of the South Indian population was found to be higher than 7°. The average values obtained from this study for overall population are 8.06 ± 3.34; for males, it is 7.42 ± 3.62, and for females, it is 8.7 ± 3.48. Thus, the average mean sample for women is greater than by 1° compared to men. This fact confirmed the importance of a protocol to an exact cranial base orientation during cephalometric assessment in multiracial population that can review anatomic differences. Hence, while ensuing with cephalometric analysis, it is better to evaluate the SN-FH, and necessary correction is to be made based on the mean values of SN-FH in between males and females in the whole population as well as in different malocclusions. The nature of the study is that this is an observational study with retrospective data and the available sample size is small and just appropriate to the power of the study. The ethical principles of radiation exposure in taking a cephalogram preclude involving the sample from general population. Due to limited availability of subjects particularly in Class III malocclusion group, only the minimum number of treatment subjects that fulfilled the inclusion criteria was included. This sample is undersized when sexual dimorphism is compared in Class III patients. Moreover, the final sample included different sample size in all the three different classes. Despite variations among different groups, the statistical significance could not be established from the data. Likewise, any discrepancy of fewer than 2° for an angular cephalometric parameter is considered to be clinically insignificant. Thus, the null hypothesis is partially rejected for as significant results are established for some of the parameters under study. Therefore, by large cross-sectional samples or by a longitudinal study with subjects categorized into different growth patterns, the most significant implication of the results of the present study for research and investigation can be obtained. The Δ value (slope of the cranial base) exhibited dimorphism and is steeper in the females and less inclined in males with respect to FH plane. Alves PV, Mazucheli J, Vogel CJ, Bolognese AM. A protocol for cranial base reference in cephalometric studies. J Craniofac Surg 2008;19:211-5. Madsen DP, Sampson WJ, Townsend GC. Craniofacial reference plane variation and natural head position. Eur J Orthod 2008;30:532-40. Foster TD, Howat AP, Naish PJ. Variation in cephalometric reference lines. Br J Orthod 1981;8:183-7. Santos RM, De Martino JM, Haiter Neto F, Passeri LA. Influence of different setups of the Frankfort horizontal plane on 3-dimensional cephalometric measurements. Am J Orthod Dentofacial Orthop 2017;152:242-9. Pittayapat P, Jacobs R, Bornstein MM, Odri GA, Lambrichts I, Willems G, et al. Three-dimensional Frankfort horizontal plane for 3D cephalometry: A comparative assessment of conventional versus novel landmarks and horizontal planes. Eur J Orthod 2018;40:239-48. Huh YJ, Huh KH, Kim HK, Nam SE, Song HY, Lee JH, et al. Constancy of the angle between the Frankfort horizontal plane and the sella-nasion line: A nine-year longitudinal study. Angle Orthod 2014;84:286-91. Ricketts RM, Schulhof RJ, Bagha L. Orientation-sella-nasion or Frankfort horizontal. Am J Orthod 1976;69:648-54. Bjork A. Cranial base development. Am J Orthod 1955;41:198-225. Moore JW. Variation of the sella-nasion plane and its effect on SNA and SNB. J Oral Surg 1976;34:24-6. Bacon W, Eiller V, Hildwein M, Dubois G. The cranial base in subjects with dental and skeletal class II. Eur J Orthod 1992;14:224-8. Tsang WM, Cheung LK, Samman N. Cephalometric characteristics of anterior open bite in a Southern Chinese population. Am J Orthod Dentofacial Orthop 1998;113:165-72. Alves PV, Mazuchelli J, Patel PK, Bolognese AM. Cranial base angulation in Brazilian patients seeking orthodontic treatment. J Craniofac Surg 2008;19:334-8. Shimizu Y, Arx JD, Ustrell JM, Ono T. Comparison of cephalometric variables between adult Spanish and Japanese women with class I malocclusion. J Orthod Sci 2018;7:19. Wu XP, Jing X, Liu HY, Xue MR, Li B. Morphological characteristics of the cranial base of early angle's class II division1 malocclusion in permanent teeth. Int J Morphol 2017;35:589-95. Hung CH. The evaluation of horizontal reference planes of adult Chinese in natural head position. Zhonghua Ya Yi Xue Hui Za Zhi 1991;10:20-9. Kattan EE, Kattan ME, Elhiny OA. A new horizontal plane of the head. Open Access Maced J Med Sci 2018;6:767-71. Giri J, Pokharel PR, Gyawali R. Angular relationship between Frankfort horizontal plane and sella-nasion plane in Nepalese orthodontic patients: A cephalometric study. Orthod J Nepal 2017;7:14-7. Jacobson A. The “wits” appraisal of jaw disharmony. Am J Orthod 1975;67:125-38. Kaur H, Pavithra US, Abraham R. Prevalence of malocclusion among adolescents in South Indian population. J Int Soc Prev Community Dent 2013;3:97-102. Andria LM, Leite LP, Prevatte TM, King LB. Correlation of the cranial base angle and its components with other dental/skeletal variables and treatment time. Angle Orthod 2004;74:361-6. Dhopatkar A, Bhatia S, Rock P. An investigation into the relationship between the cranial base angle and malocclusion. Angle Orthod 2002;72:456-63. Awad AM, Gaballah SM, Gomaa NE. Relationship between cranial base and jaw base in different skeletal patterns. Orthod Waves 2018;77:125-33. Damstra J, Huddleston Slater JJ, Fourie Z, Ren Y. Reliability and the smallest detectable differences of lateral cephalometric measurements. Am J Orthod Dentofacial Orthop 2010;138:546.e1-8.